Tangy.allineed.in a website which finds restaurants around YOU ! We are officially launching our website www.tangy.allineed.in today April 12, 2011 for Bangalore city. This is a basic version of the website, which is capable of automatically detecting your Current location and searching restaurants around you. This website is very easy to use. 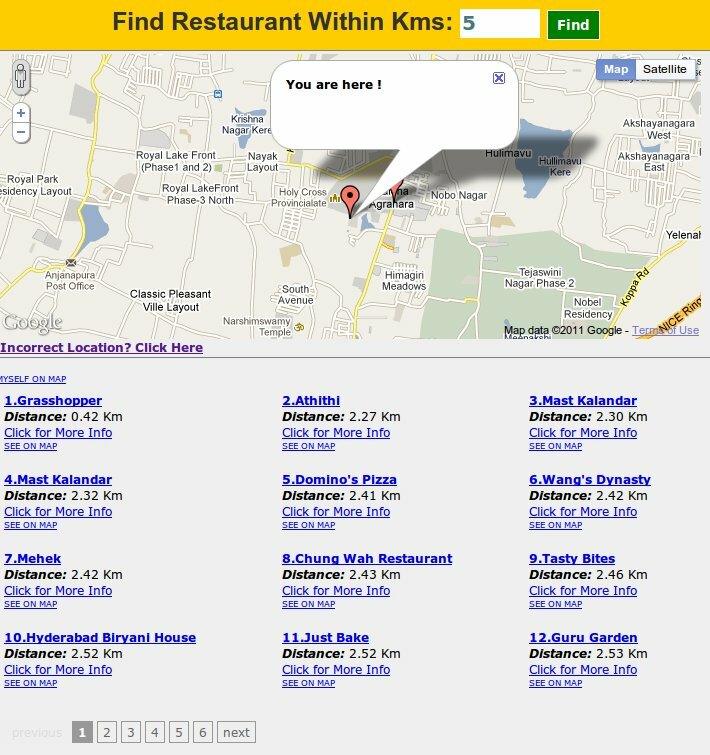 You just need to mention the distance within which you want to get the list of restaurants, then press FIND. Bang!!! It will give you the restaurant names and other details like Address, phone no, landmark and locate them on the map provided. There are some browser (e.g. Internet Explorer) doesn’t allow location detection, in such cases you can set your exact location by searching the same on a utility provided at the link Reset Location. On a fine day, after hectic shopping at a popular local market in Bangalore, I wanted to eat something nice and tasty. Apart from the market, this area was totally alien for me. I didn’t know any nearby restaurant which can serve mouth watering food. I tried asking people around, which resulted and got unsatisfactory responses…. Then, myself as software professional, tried querying our IT God, The GOOGLE. It gave me few websites which can help searching restaurants in a locality. After trying them, I realized, I should better find some other way else would lose my interest of eating itself. Finally, I found a restaurant and its address. Thanks to the autowala who helped me reaching to the address. I relaxed myself in the pleasant ambiance of the restaurant and asked waiter for menu. After browsing through it, I ordered south Indian special foods. While enjoying nice meal at the restaurant I thought, If there were a website which can find places around me(not in some unknown locality) and help me reaching there, I would not have struggled this much. I started thinking what all this portal could have, how this can be done etc., And the idea for creating this website came into existence. We have collected around 1400+ food places in Bangalore and able to locate them on the map. We are in the process to collect the all restaurants to cover entire Bangalore. We want tangy.allineed.in to make such a website that, it can serve you fast with highest accuracy. Search restaurants within 50 km radius of your location. All the restaurants can be located on the map. Address, phone no, and landmark for each found location. Soon we will be coming up with mobile and advanced web version with lots of features to make your restaurant search easiest ever.